The Noon Onyx series just gets better and better. 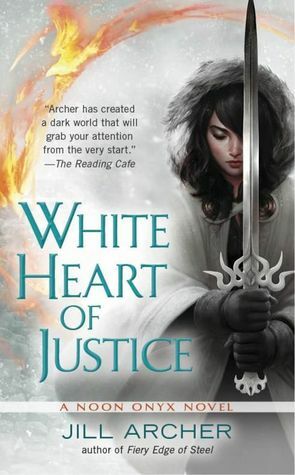 The third book in the series, White Heart of Justice, takes Noon on a journey with a new set of trials as we learn more about this fascinating world and the people in it. Although we did receive this book for the purpose of an honest review as well as the first book in the series, Dark Light of Day, we purchased the second book, Fiery Edge of Steel to read. This is a series in which each book builds upon the previous book. To be able to really understand the intricacies of this alternate reality and connect fully with the characters, you must read it from the beginning. Trust us, it is truly worth it as the world-building is engaging and fascinating, the characters are intriguing and seem to continually evolve, and the adventures are nail-biting. We will attempt to not spoil the HUGE twist at the conclusion of Fiery Edge of Steel, but it may be unavoidable in this review. Please take care if you choose to read this review without having read Fiery Edge of Steel. White Heart of Justice picks up about six months after the conclusion of Fiery Edge of Steel. Noon is still trying to move on from the heart-breaking revelation we experienced. Throwing herself into her training and schooling, Noon is now the Primoris for St. Luck’s. The novel starts off in the final battle between Noon and her opponent in the New Babylon MIT (Maegester-in-Training) rank matches. The top ranked MITs from each school at the conclusion of the matches are eligible to compete in the Laurel Crown Race. Of course, Noon makes it and is given her assignment. This assignment, if she completes it, would be recompense for her destruction of the statue of Justica in the Joshua School. However, attempting to recover the White Heart of Justice – a sword of immense power, may just be a suicidal mission. Teamed with her guardian from the previous book, Rafe, Noon will race to find the sword and return it. However, nothing is as it seems. Typically each assignment is given to only one Lauren Crown participant. However, Noon and Rafe are competing against two bloodthirsty opponents, who not only seek to gain the sword, but destroy Noon in the process. Gikany and Una thoroughly enjoyed this third book in the captivating Noon Onyx series. We absolutely loved the chemistry between Rafe and Noon and the subtle dance between them. Though the overall story arc of retrieving the sword was gripping and intriguing, we were surprised by the depth of the soul searching that Noon experiences during this trial. Her growth over the course of these books is immense and heartfelt. Her connection with Rafe is just as compelling as it was with Ari. The betrayals she experiences on her journey illustrates our heroine’s iron will and determination. Although we are not sure of the choices she makes at the end, we are eager to see how the next novel will play out. Through White Heart of Justice, we feel you truly get to know Rafe. He really shines in this novel. We love him. The path his life has taken and the courage and strength of will he possess are staggering. The contrast between him and Peter is extreme. It seems to us that Peter truly wanted Noon for what he would gain through her. He wanted the power that would come from successfully casting his reversal spell, and keeping her as a living trophy. Ari was different in that he wanted her to embrace who she is. However, he pushes her almost as strongly as Peter did. Ari pushes Noon to accept herself and thrive as a maegester and yet continually tries to protect her at the same time; this forceful aspect was not healthy. But there is no doubt of his all-consuming love for her. Then we have Rafe who seems to embrace who Noon really is and encourages her spirit. Out of the three, it felt as if the relationship between Rafe and Noon was truly a healthy relationship. Though Noon’s heart seems to belong to Ari, it was gripping to watch Noon search her feelings and work with Rafe. The revelations through the story were heart-wrenching with twists we could not adequately predict. It may seem as if the romance is a larger part of the story, it is not. The balance between Noon’s entanglements is woven neatly within the overall story arc – which is the majority of the novel. It is amazing how well woven the mythology and other aspects of the novel are worked into the overall story. We truly enjoy the Noon Onyx series; it is engaging and exciting while being heartfelt throughout. If you are looking for something different – this alternate realty where the apocalypse has occurred and the demons won – you should really think about picking up the first book, Dark Light of Day and enjoy the journey. This sounds like a good series to get into! I’d follow your suggestion and start from the beginning, but it sounds like a good one to have in my collection. Thanks for the great review! Thank you! I think you may enjoy it. It’s a very different mythology, but still a character driven series. I hope you enjoy! Yes, they are really well done!